Jim Drinan welcomed the group expressing thanks to all who attended the National Planning Conference (NPC). 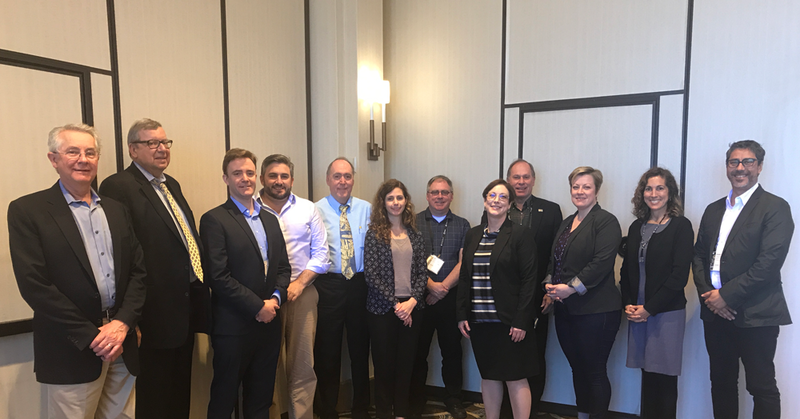 From left, Tim Van Epp (APA), Jim Drinan (APA), Harry Burchill (RTPI), Brendan Nelson (PIA), Ric Stephens (ISOCARP), Beth McMahon (CIP), Ken Forrest (CIP), Cynthia Bowen (APA), Jeff Soule (APA), Eleanor Mohammed (CIP), Stephanie Firestone (AARP), and Roberto Moris (Chilean Planners). GPN members sponsored or participated in 30 sessions, on a variety of topics including sustainable development, heritage conservation and transportation. The focus of WUF 9 was on the practical aspects of Sustainable Development Goal (SDG) implementation. APA sponsored an SDG panel that demonstrated SDGs implementation by US cities including New York and San Jose. In July 2018 there will be a high-level UN meeting on implementation of the SDGs and the New Urban Agenda. APA will attend and participate in the discussions on behalf of GPN. A number of sessions focused on international planning issues and cases while others included international examples. Sessions were uniformly well attended. APA will be doing follow up review and analysis of the NPC and will share any highlights. The International Dinner was held at Galatoire’s. There may be a perception problem with GPN most often being represented by white officials of English-speaking, Commonwealth country planning associations. An International Committee has been restarted. This year is the CIP Centenary which will be celebrated July 13 in Ottawa. They are developing policies around issues like indigenous communities, healthy communities and climate change and are working, through their international officer, on a publication Plan Canada. This will include an international section on best practice and suggest a link to the GPN would be useful. CIP will be attending the Caribbean urban forum in June and noted that there will represent GPN there. ISOCARP and the World Bank are developing a partnership to provide technical assistance and professional planning services to developing countries. The next WUF will be in Dubai in 2020; GPN should to start planning soon. The next ISOCARP congress is October 1-5 with the theme “Cool Planning” to focus on climate change action. GPN should consider representation to deal with international crises. Such organizations exist at national level (e,g, Canadem, Canada and NORCAP, Norway). The Global Alliance for Urban Crises (GAUC) is developing training and rosters for humanitarian disaster response. This should be a topic for NPC19. Noted that RTPI and ISOCARP have representatives on the Global Alliance for Urban Crises. There were 8 international sessions at NPC 2018, including 6 endorsed by the International Division. An International Track has been established for the NPC 2019 in San Francisco. The portal for session proposals will be open June 1 through June 25. Only APA members can submit proposals, so we are evaluating whether co-sponsorship is possible; in any event, we are open to session suggestions and speakers from other GPN members The international sessions should be coordinated theme-wise with each other and with other divisions/domestic sessions. Session concepts include: GPN overview, UN Habitat Planners for Climate Change, Indigenous Peoples (and Working Abroad, Livable Communities for ALL Ages). GPN should proactively engage and invite representatives of its full membership of 30+ country associations to the NPC. PIA will be taking over the lead of GPN Starting with the next meeting. The GPN 5-year plan should be revisited and revised accordingly. International planning awards is something GPN could consider. PIA is advocating an Australian national settlement strategy. National Government is recognising immigration is a hot topic with the press, and represents a strain on growth and infrastructure. Australia has appointed a Minister of Cities and PIA is advocating for a national chief planner. PIA would like to further discuss GPN Governance and hopes to ensure continuity. They suggest setting up an International calendar so members can support each other’s’ events and recognise international best practices links on the website. Emphasized how planning is becoming global, e,g. : aging is now a global issue, not just a western problem. Resilience, risk management, technology, and immigration are all issues that reflect the need for stronger international links between planning professionals. Chilean planners are in the process of organizing themselves. There is a change in executive leadership at RTPI: All expressed thanks to Trudi for what she has done and looking forward to meeting Victoria Hills. RTPI is actively engaged with the new National Planning Policy Framework in England (we had fought strongly for SDG’s to be included). Highlighted better planning programmes and briefly summarised research including location of development. Also mentioned work on UK Built Environment Advisory Group (UKBEAG). Sponsored a session at NPC 2018 on Phase 1 (funded by an APA Divisions Council $7K Research Grant); another session will be held later this summer and then a Phase 2 session at NPC 2019 in San Francisco. Phase 2 funding– AARP is considering internal 2018 funding and is working with Christine Ott, APA Development Director, to find external funding for 2019 (in addition to in-kind resources that APA can provide). For a July 9-18 aging side event at another conference, AARP invited suggestions from the group on global south aging and livable community experts to speak. UN Habitat Strategic Plan is open for comments and will guide their work over the next 5 years. We mentioned the High Level Political forum in NYC this July which will be attended by APA and will offer an agenda that GPN can incorporate in an updated work plan. China made World cities day a national holiday. GPN needs to decide what activities it will do / promote. Everyone agreed that last year’s effort to decentralize the WTPD effort was a step in the right direction. Eleanor explained that CIP takes a piecemeal approach; some local governments persuade their mayors to issue a declaration. Perhaps other members could persuade their local officials to do the same, supported by a hashtag. PIA will call the next meeting in late May-early June.